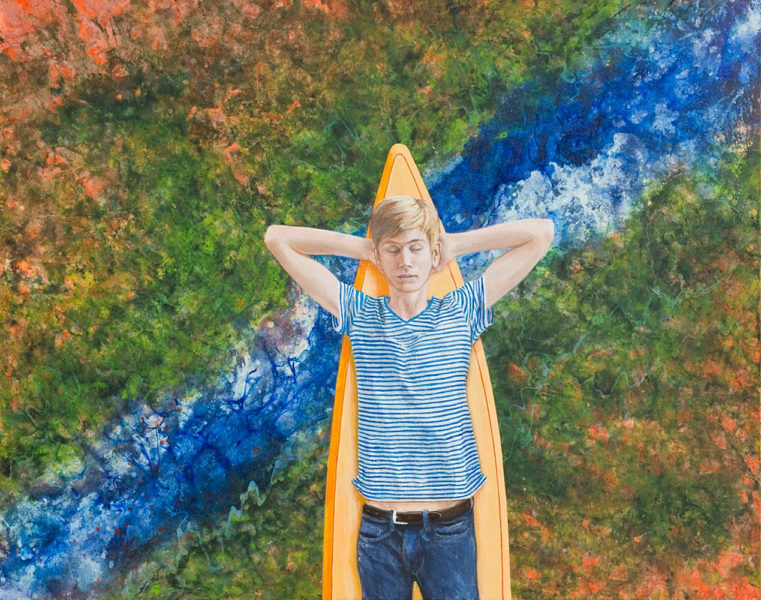 A boy is lying with eyes closed and his arms crossed behind his head on a surfboard. Behind him a running brook flows diagonally through the picture. Its water makes the vegetation along the bank grow and thrive on the reddish desert soil. The boy on the surfboard and the landscape do not really fit together. The stream is too narrow. The boy is painted frontally, as if standing upright, while the river is presented as viewed from above. This way it looks as if the boy is floating high above a river that flows far below. This perspective indicates that the stream not only flows below him, but also through him, carrying his thoughts along into distant worlds. The surfboard and the water inspire his mind to travel, to surf without limits through the worlds of adventure, fantasy and dreams. He is relaxed as he is lying there, his mind turned inwards, concentrating on what he sees in his inner self. He does not exactly look like a dreamer who seeks to escape reality. Rather he seems to want to see what kind of longings, wishes and messages can be conjured up from the depth of his life, so that he can follow, realise and experience them. Jacob experienced in Bethel how important dreams could be as a place for revelation. In his sleep he saw heaven opened, with angels ascending and descending and he heard God speak to him (Gen. 28:11-17). His son Joseph (Gen. 37:5-8) and Joseph, the fiancé of Mary (Mt. 1:20; 2:13; 2:19), also repeatedly had the experience of God showing them in dreams what he intended for them. The surfboard, which from its shape suggests a mandorla, also alludes to divine revelation and with it to the glory and healing power of God. Its orange colour connects it with the similarly coloured soil and charges the earth, as it were, with energy. In this way the barren desert soil acquires a divine and inexhaustible potential. The orange and the blue, orange’s complementary colour, complement and complete each other: God reveals himself in the desert as well as in the water, in the silence of dreams as in surfing adventures on the waves. The boy’s elbows and the tip of the surfboard ‘happen’ to result in the upper part of a star, inconspicuously indicating that ‘stellar’ moments of the extraordinary nearness of God can happen anywhere. Finally the boy invites me to contemplate, to reflect in silence. He invites me to spend time with God, to look inward for God’s plan, for my unique calling in the continuation of his creation and guidance of his people. A meeting with God can take place on a surfboard. Any place of silence can be a springboard to HIM and to the reality or task that is assigned to me. The artist’s paintings and light sculptures of his brother are exhibited in the Galerie Freiraum 16 in München until August 10, 2018. Gerhard Knell: The Dreamer, 2017, acrylic on canvas, 145 x 110 cm. Gerhard Knell (b. 1962) is a German artist who paints landscapes that deal with the relation between human beings and nature. They are a mirror of the soul. http://www.gerhardknell.de/; www.malblog.gerhardknell.de and instagram account artof_gerhardknell.